Do you purchase packaged fruit or veggies? 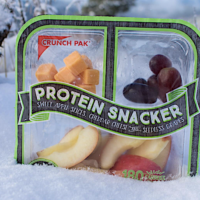 Answer a few quick questions to score FREE Crunch Pak Product Coupons! These coupons will be mailed to you. Allow 4 to 6 weeks for delivery! Would like samples. P.O. Box 366 Dragon, AZ. 85609. Thank you! Previous post: I Got My FREE Essie Nail Polish! Did You Get Yours?